Ireland will play host to one of the most spectacular circus displays in the world when the Moscow State Circus returns to our shores as part of it's European tour. Ireland will play host to one of the Worlds most famous Circus when the Moscow State Circus opens with its new production GOSTINITSA – Hotel of Curiosities. GOSTINITSA is a landmark production for The Moscow State Circus blending the best of the Circus art forms with the glitz and glamour of the 1930s Hotel scene and a sparkle of Hollywood. Delivering this new production is the culmination of years of work, planning and endless creative discussions. The creative team have designed the show specifically for a big top which is perfect for the experience we have in store. 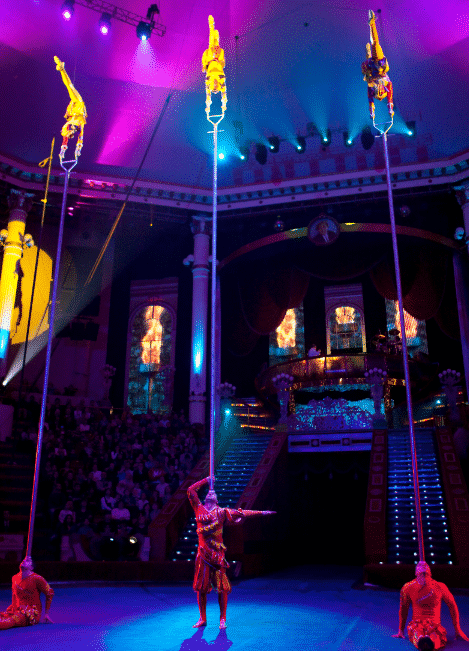 Prepare to be swept off your feet by GOSTINITSA, a rapturous and passionate new circus experience that unifies the Moscow State Circus with the glorious Golden Age, a show that promises to have all the spectacle and nerve-tingling, edge of your seat feats for the whole family. The artists have been in training ready for this world-beating performance, which promises to be breath taking. The Moscow State Circus rolling into town is always a magical experience for families to come together witnessing some unbelievable acts. Award winning Clowns – Chervokins Duo, will guide the audience through the Hotel of Curiosities featuring acts including acrobatics on Europe’s only DOUBLE Russian swings. Flying through the air and somersaulting from one fast moving swing to another, incredible! The Alikhanov Troupe perform on two ten meter pole’s balanced on one shoulder of a man with not one but three girls climbing and spinning to the very top of the same pole. High Wire – five people walking the high wire. Plus unicyclists, acrobatics, trapeze artists and the unforgettable GOSTINITSA bellboys performing an incredible skipping act with a twist! Don’t miss this amazing show, created especially for a European audience all housed in a state of the art centrally heated theatre style luxury Big Top.